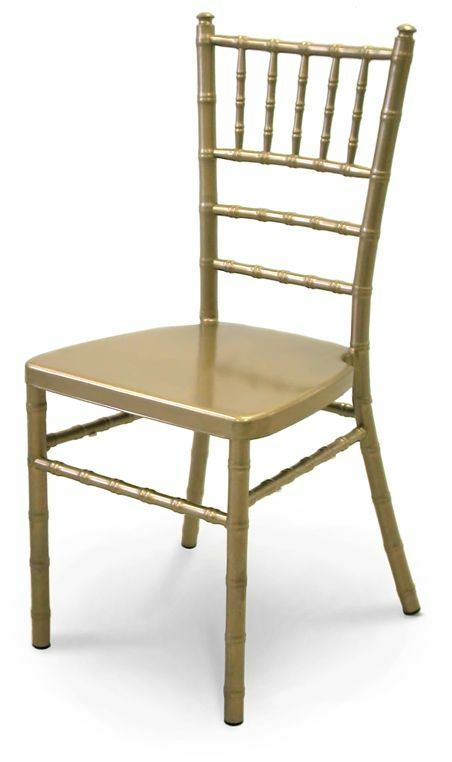 A reliable chair for high profile events and business functions. Lightweight aluminum construction offers extreme durability for years of service. 100% welded for superior strength. Main frame 1 1/4” diameter x 2.0 mm aluminum tubing. 4 leg braces of 7/8” diameter aluminum tubing. Seat is stamped aluminum with 5/8” square aluminum tubing cross brace for strength and durability. Static load tested to 1000 lbs. Each leg is capped with non-marring ABS plastic glides. Side leg braces feature two rubber stack buttons to protect the seat surface of the chair below when stacked. Individual chair weight 7 lbs. 64”H x 18.5” W x 25” D, 42 lbs. 58” H x 18” W x 26” D, 42 lbs. Gold, Silver, White, Black or Mahogany powder coat finish. Polyester cover features piping on upper and lower seam, hook & loop fasteners and zippered back for laundering. Cushion is 2" thick and 15"Wx15.5"D. Available in White, Ivory, or Black. Full 1 year limited warranty against manufacturing defects under normal use. McCourt Manufacturing will repair or replace (at our option) at no charge; customer assumes all freight charges.